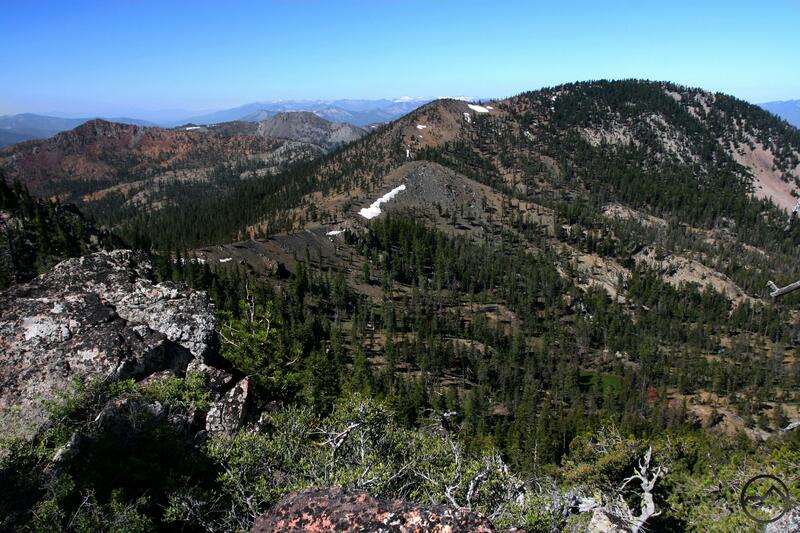 A ridgeline hike generally lacking a trail that climbs to the summit of China Mountain, 4th highest peak in the Mount Shasta region. The route offers great views of Mount Shasta and the various ranges of the Klamath Mountains, including the Trinity Divide, Trinity Alps, Scott Mountains and the Marble Mountains. The Scott Mountains and Trinity Alps from China Mountain. The Pacific Crest Trail winds through the Scott Mountains for 40 miles. Half the distance is on the east side of Highway 3 while the other half lies in the Trinity Alps Wilderness, west of Highway 3. 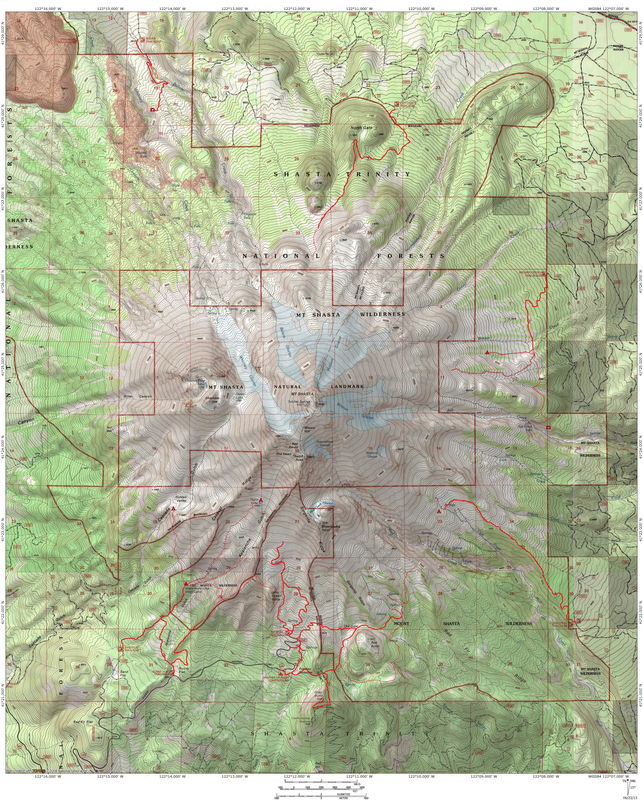 China Mountain is the first major summit passed once entering the Scott Mountains and is the highest mountain along the PCT between Mount Eddy to the south and Mount McLoughlin in Oregon. 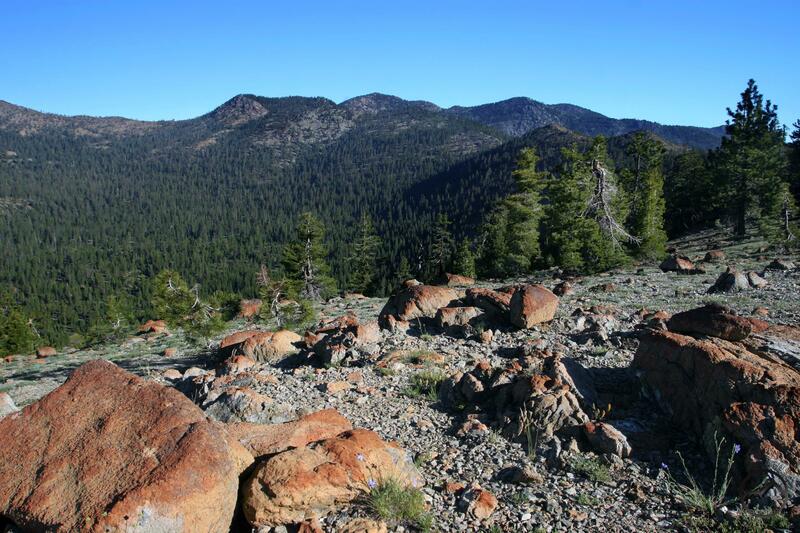 Although the route to China Mountain follows the PCT for only a mile, it is a very scenic mile, offering great views of the Trinity River and High Camp Peak. The rest of the route to the summit traverses the crest of the Trinity Divide as it merges into the Scott Mountains and offers great views of the Mount Shasta, Mount Eddy, the Scott Mountains, the Trinity Alps, the Russian and Marble Mountains, the Shasta Valley and north in Oregon. China Mountain from the Pacific Crest Trail. Depart north from the PCT trailhead at Parks Creek. The trail passes an old quarry on the left before dropping below the crest of the mountains. The route maintains a level grade, slung high on cliffs above High Camp Creek, the northernmost tributary to the Trinity River. The river can be heard far below. The trail rounds a large rocky bluff turning west and then north. High Camp Peak and the Cement Bluff are prominent landmarks across the canyon. A sliver of meadow-rimmed Bluff Lake, at the foot of the Cement Bluff is visible for a short while. China Mountain is visible towering above the end of the canyon. The PCT eventually continues north. After a mile of level hiking, the trail passes through a lush meadow, only 40 feet or so below the crest of the mountains. 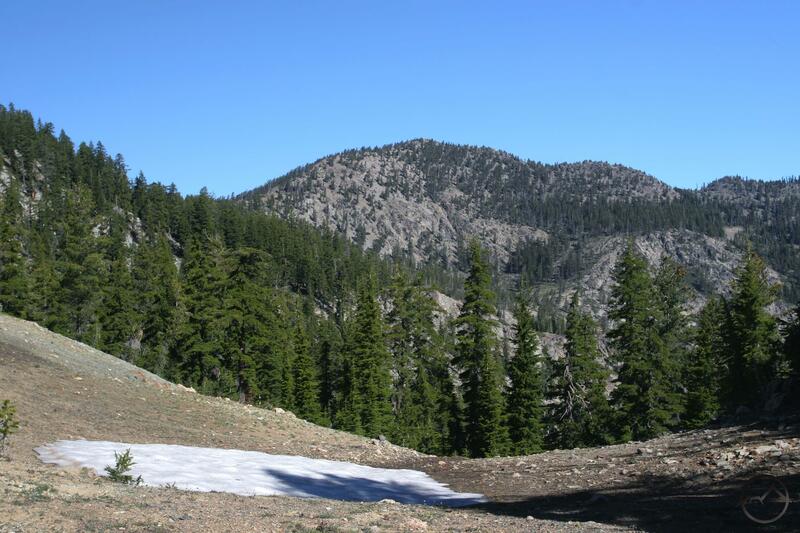 Hike up the meadow to the crest and continue along it to the north for about 0.75 miles. While it is possible to follow the actual crest, it is easier to contour around the east side of the crest, staying a little below the top. This allows one to dispense with needless elevation change. The ground is also firmer on the east side while the west side of the crest is steeper and has more loose soil. Views from this section of trail are great, particularly to the south, where Mount Eddy and Mount Shasta dominate. China Mountain rises above the ridgeline route. After 0.75 miles, the crest drops down to a low saddle. There is an optional way to reach this saddle, aside from following the crest of the Trinity Divide. Rather than departing the PCT at the meadow, continue on the trail for another 0.75 miles until the trail begins heading to the west in earnest. There is a small, dry, rocky gully comes down to the trail from the right. Following this gully up the steep slop will ultimately lead to the aforementioned saddle. 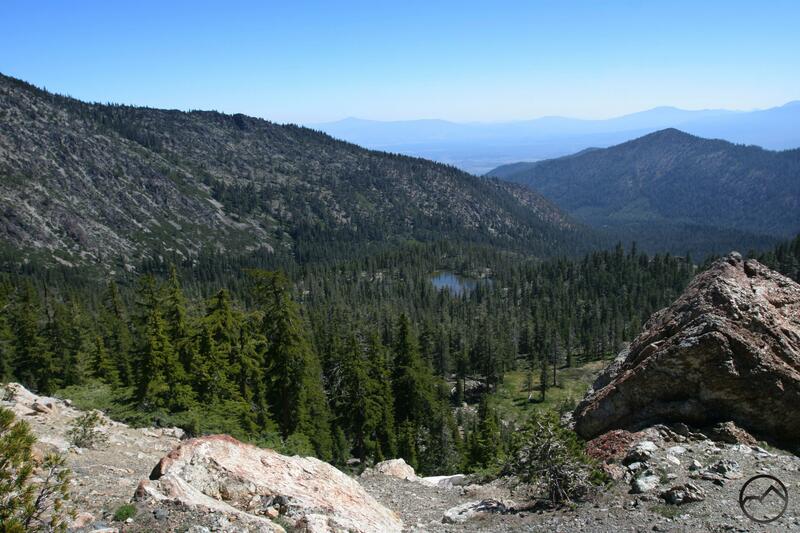 While this route allows one to stay on the PCT longer, it adds a steep climb avoided by the previous route. Furthermore, the gully is easy to miss and one also loses the views found on the crest. From the saddle, the route basically follows the ridge all the way to the summit. There are three areas where precaution should be taken. First, the ridge immediately north of the saddle has some stretches covered by a horrendous brushfield. Rather than bushwhack through this, it is easier to pass through the small fir glade to the west and then hike up the thinly forest slope to reconnect to the ridgeline beyond the brushfield. The route continues along the ridgeline again for nearly 0.5 miles. Middle Caldwell Lake can be seen in the basin on the east side of the ridge. 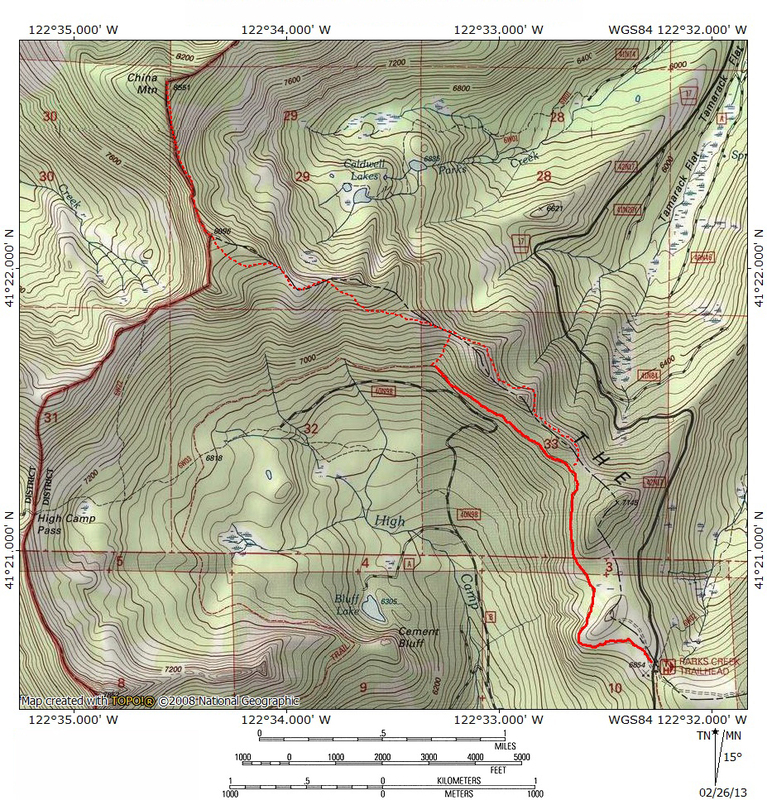 If the preferred route to the summit of China Mountain was through the Caldwell Lakes basin, the route would join the current one at this point. From here the ridge heads west and then bends northwest. Another obvious brushfield becomes visible at this point. Again, rather than struggling through it, simply continue on below the crest, through sparse, stunted trees. Regain the crest just east of Point 8096. Continue to the point, where the knife edged ridge leading to China Mountain becomes visible. China Mountain beyond the knife edge. 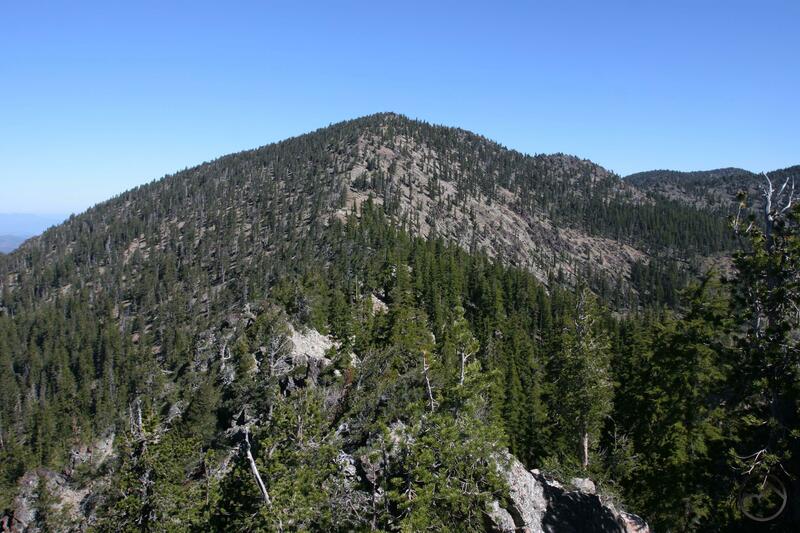 The knife edged ridge is the most difficult portion of the route leading to China Mountain. While not sheer cliffs, the slopes on either side of the rideline fall away steeply. The going is complicated by the presence of craggy rocks and stunted trees, a departure from the generally open terrain that has characterized the route to this point. Although caution is necessary, it is fairly easy to work ones way across the ridge to the actual slope of China Mountain. From here, it is simply a matter of climbing the steep slope up to the summit. The best way to accomplish this is by staying on the west side of the ridge. The east side is far steeper. Although the summit is just below treeline, the trees through this final phase are short and stunted. From the top of China Mountain, the views are seemingly endless. From Mount Shasta City, drive north on Interstate 5, through the town of Weed. Exit at the Edgewood/Stewart Springs exit. Turn left and drive under the freeway, then turn right onto Old Stage/ Old 99. Continue north for a couple hundred yards and then turn left onto Stewart Springs Road. After 4 miles, Forest Service Road 17 splits off to the right. Follow this road to the Parks Creek trailhead.